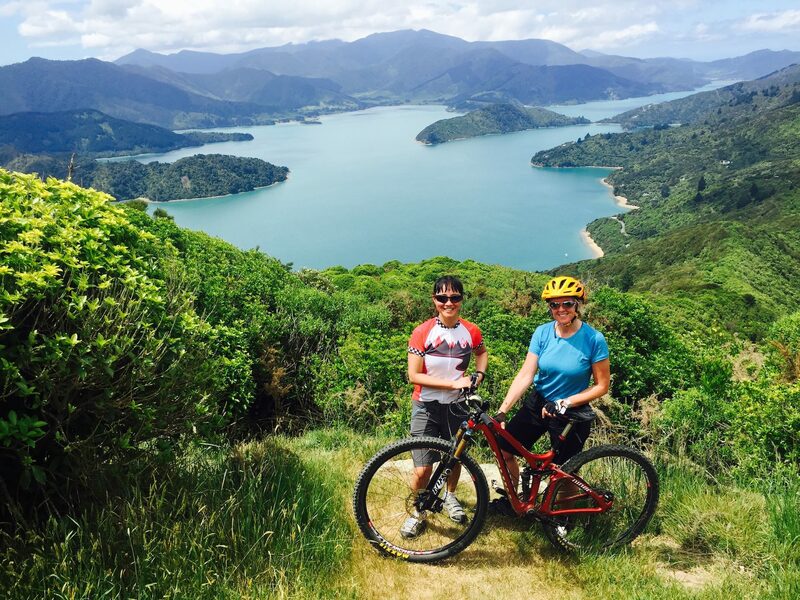 Ride Queen Charlotte Track - Nelson - Golden Bay - West Coast Classic Kiwi Gems - Heli Bike - Ride Part Of The Old Ghost Road - Backcountry Hut Experience - Kirwans Track - Craigie Burn Beauties - Queenstown Epics - Rude Rock - Skippers Canyon + More hidden epics! You’ll be arriving into one of NZ’s sunniest, wine loving towns, home to beautiful sauvignons blancs, and sun drenched valleys of the Marlborough Region. Most of you will have arrived a day or two prior to settle in and recover from jet lag. Today, your guides will be arriving to meet you at The Blenheim Palms Motel at 10:00 a.m.. You will need to be packed up to move to a new accommodation today. We’ll be offering a ‘Bike Assembly’ session at the bike shop next door this morning. We’ll also be offering an airport pick at 11 a.m. for those flying in. This afternoon, after the ‘Bike Assembly’ session and rounding up all the crew members, we’ll hit the road and head off to a small local seaside town called Havelock for the night. We’ll settle into the accommodation and tonight we’ll get together for a group BBQ and go over the epic adventure ahead! We’ll start this trip of a lifetime off by heading north to the head of The Marlborough Sounds, just down the road from our lodge. After driving through the lush countryside, we’ll gear up to ride The Queen Charlotte Track. The Queen Charlotte Track will take us through beautiful native New Zealand fern forests, past stunning green bays and golden sandy beaches. 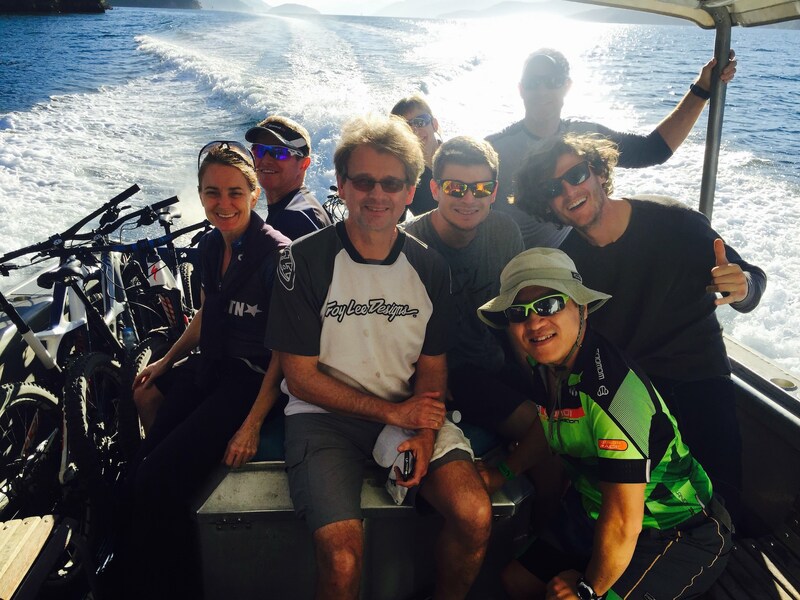 We’ll ride our way into the heart of The Marlborough Sounds, and enjoy a swim or two with local stingrays in one of the beautiful sandy bays. We’ll then keep on riding and make our way back to the start of the track. Tonight, we’ll head back to Havelock, where you can enjoy some local Green Lip Mussels or delicious Kiwiana food from local seaside eateries. Rising to the sounds of Bell birds and the crisp, fresh scent of the ocean, we’ll embark on another days incredible adventure as we set out and drive over to Nelson and Motueka in the scenic Tasman Bay. From here, we’ll make our way over to the start of Golden Bay, which is a tropical paradise at the top of the South Island. We’ll gear up for an all-time favorite – the epic Rameka Track. We’ll warm up with a loop on the super fun Canaan Downs Track first, before descending into some sweet Kiwi singletrack. The Rameka Track winds through beautiful native bush before heading down through open pasture land, to pine forests before hitting native forest again. You’ll be begging for more! This track has been known to render riders “speechless”. We’ll ride into the hippie town of Takaka, where any worries are said to be washed away! Rising early to the smell of fresh flat white coffees, we’ll make our way over to Nelson, where we’ll be embarking on one of Nelson’s most classic mountain bike tracks. Here we’ll gear up and take on the local’s Coppermine Saddle Track. A grunt of a 1000 m climb, starting in pine trees, riding through native bush and then rising into the dry alpine with views across the Tasman Bay, this ride is a real goodie! The sweat and tears are all worth it for the flowy, red rock downhill on the Fern Gully Track! We’ll hop in the river for a swim to cool off, then ride back into Nelson Township for a cold craft brew in one of our favorite apres ride hang outs. Today, we get a well-deserved rest day in the funky town of Nelson, as it has lots to offer off the saddle. Nelson is well known for its mountain biking as well as its art scene and local produce; it won’t disappoint. This is a gem of a town and one of the sunniest in NZ (and the craft brew capital of the South Island, might we add); it has a European feel with loads of cool cafés and pubs. Take a ferry over to the stunning Able Tasman National Park, go for a ride or savor the awesome local restaurants and cafés. The Saturday morning markets make for a great start to your day! After an early start, we’ll head west to the ghost town of Lyell and get ready for a good climb up part of the Old Ghost Road. Here, we’re heading into New Zealand’s newest and epic backcountry singletracks ever made. We’ll ride up a well graded incline of awesome singletrack, through magical forests and alpine ridge lines of the wild west coast. The Old Ghost Road is NZ’s longest singletrack, comprising of an impressive rugged 87 kms in total. Today, we’ll ride and enjoy a stunning part of it! This afternoon, we’ll head over to the real wild west of New Zealand, and gear up to fly high in a helicopter! We’ll strap the bikes up and set off in style to the top of The Victoria Range to a sweet hut perched in pure beauty overlooking endless ridgelines of west coast wilderness at its finest! We’ll be on top of the world mates! Please Note: Weather and/or riding abilities may dictate the heli-bike to be changed to the Croesus Track. Heavy rain does not allow us to chopper up here. Please Note: The Heli-biking experience requires all bikes to be strapped securely to a rope that hangs under the chopper in flight. Although the bikes are packed with care, it is likely for the bikes to shift during air transport creating scratches on the bikes paint. If you are concerned with your bike getting scratched, you have the option of wrapping your bike in a foam pad which we will supply, and you will then be responsible for riding out with the foam pad in your backpack. Renting a bike through the Add-Ons tab is also an option. Sacred Rides is not responsible for scratches on bikes. 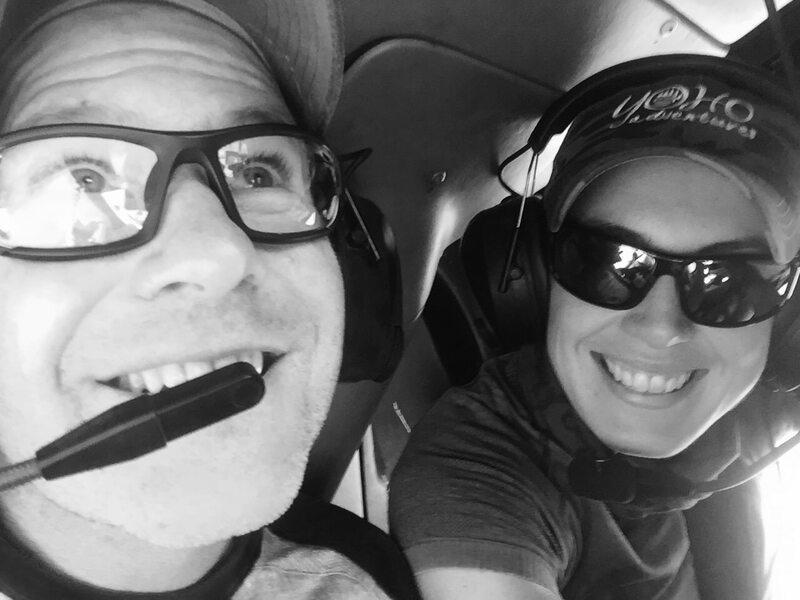 CLICK HERE to watch actual video footage from one of our Heli-biking trips! KIRWANS TRACK EPIC ADVENTURE DESCENT! Rising to the smell of fresh brewed coffee and great views, we’ll test our brakes out for our awesome mission ahead! We’ll be enjoying a 1100 m descent down the premier Kirwans Track. We’ll flow through stunning Beach tree and Fern Gully forests on this epic technical descent! After our ride, we’ll hop in the shuttle and drive down the Grey Valley heading inland, up and over the Southern Alps to the Craigieburn Forest. Rising to the high dry mountains, we’ll get back in the saddle for some epic riding in Craigieburn Forest. Tackling an uphill gravel road to the bottom of Craigieburn Ski Field, we’ll take a short rest before heading down the well-named Edge trail which leads on to a track called “The Luge”. After the Luge, a short uphill is followed by the new Dracophyllum and Hogsback Track. This is New Zealand’s singletrack at its best mates… a real hoot – sweet singletrack all the way! We’ll rest our muscles as we drive to the high dry McKenzie Country to the stunning turquoise waters of Lake Tekapo, also home to the clearest skies in the world! Waking to the beauty and stunning landscapes of the Mackenzie Country, we’ve got an inspiring singletrack ride to warm up with, which flows through native Tussocks along with incredible views of the turquoise tainted Lake Tekapo. We’ll then move onto our secret gem of a ride which flows through the best alpine views the South Island has to offer. Imagine riding through high peaks, sheep and flowers on a super fun cross country ride, ending with a cold beer (or two)! We’ll ride to our unique accommodation tonight – we’ll be staying in a converted shearer’s quarters with views to die for. It doesn’t get more Kiwi than this mates! After leaving this breathtaking place, we’ll head down to Central Otago, home to semi desert like landscapes, great Pinot Noirs and amazing riding. We’ll enjoy another postcard drive as we head over the Lindis Pass, and on to the beautiful lakeside town of Wanaka. Here, we’ll spend the afternoon riding some amazing, fast, flowing singletrack made by the keen local mountain bike community. We’ll ride Dean’s Bank, a flowy and fun local ride. 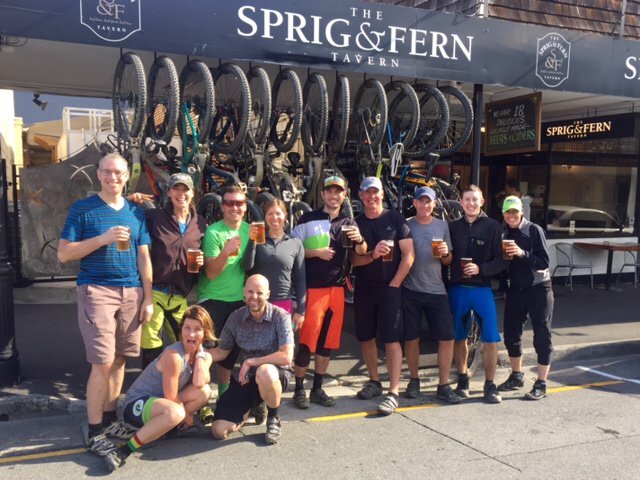 After the ride and a cold brew, we’ll make our way up to the Cardona Valley and over to the adventure tourism capital of the world known as Queenstown! Our ride of choice around these parts starts up on Coronet Peak, offering specatulcar views over the Wakatipu Basin. We’ll enjoy a few laps on the epic downhill track known as Rude Rock, before flowing onto the Skippers Canyon Pack Track. We’ll shred down into the remote Skippers Canyon, before climbing out onto the classic Zoot Track. After smiling from ear to ear from these incredible trails, we’ll enjoy some free time in the afternoon for whatever adrenaline activities that catch your eye (there are heaps in Queestown). We’ll have our final farewell dinner and drinks tonight! Our last morning of the trip! Sob, weep, waaaaa! High five your new riding pals and say your goodbyes. Today, breakfast will be on your own, as Rider’s departures times and plans vary. Your guides will be doing drop offs at the Queenstown Airport at 10:00 a.m. or at your hotel of choice in Queenstown by 11:00 a.m.
WE WANT TO ENSURE YOU ARE RIDING WITHIN YOUR ABILITY AND FITNESS LEVELS WHEN BOOKING ON ONE OF OUR SINGLE TRACK MOUNTAIN BIKE ADVENTURES. PLEASE REFER TO THE FOLLOWING TECHNICAL SKILLS & FITNESS LEVELS RATING BELOW. IF YOU NEED MORE CLARIFICATION PLEASE CONTACT US SO WE CAN MAKE SURE YOU ARE COMFORTABLE WITH YOUR CHOICE OF TRIP! 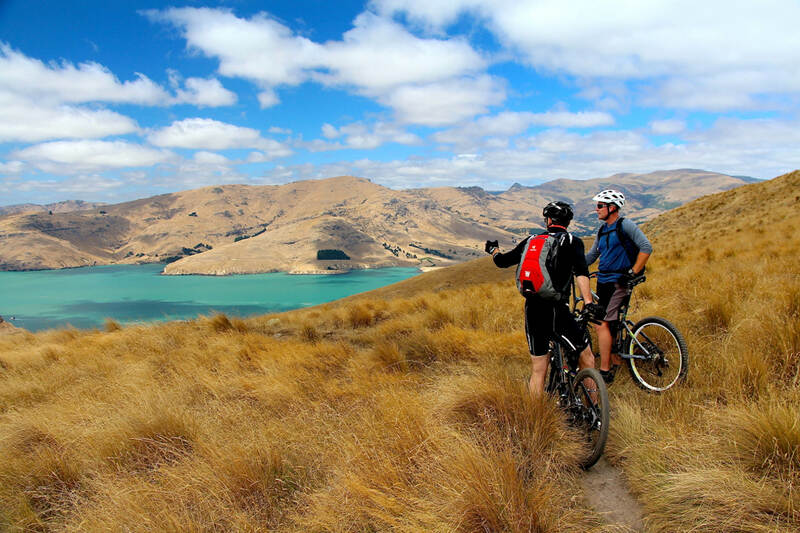 We’re a team of adventurous Kiwis who love mountain biking.